The SZ, or Sport Zagato, announced Alfa’s return to sporting cars after their acquisition by Fiat. 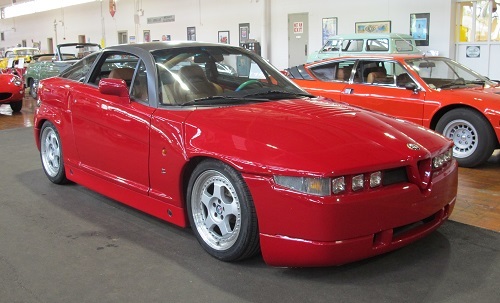 Known internally as the ES-30 (Experimental Sportscar 3.0 liter), the SZ was the result of a collaboration between parent Fiat, Alfa, and the carozzeria Zagato. Based mechanically on the Alfa 75 (Milano in the US), the styling was led by Fiat’s Centro Stile chief designer, Frenchman Robert Opron. Exterior details and the interior were handed off to junior stylist Antonio Castellana, while Zagato contributed their expertise in composite body construction, plus their trademark “Z” applied to the flanks of the little coupe. 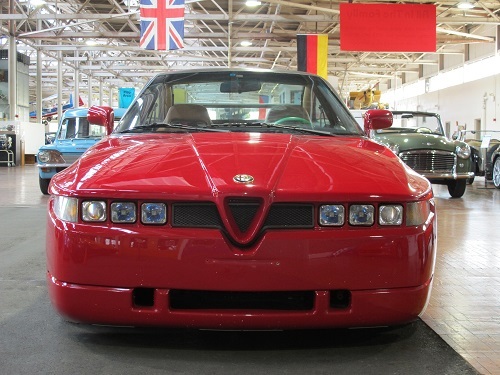 Alfa, of course, used the 75’s floorplan, suspension design, transaxle, de Dion rear end, and a highly-tuned version of the famed Giuseppe Busso-designed SOHC 3.0l V-6. Unveiled at the Geneva Motor Show as a Zagato prototype in 1988, the reaction was strong, even polarizing, and Fiat decided to produce a limited run of 1000 cars under the Alfa Romeo badge. 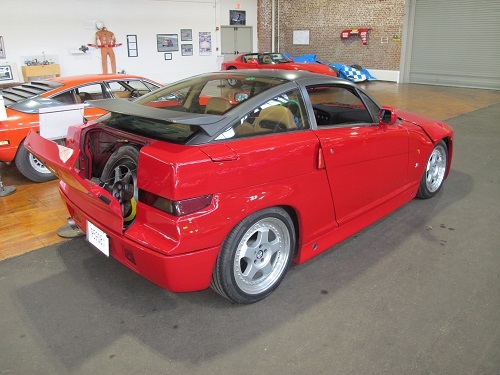 While the suspension was of the same geometry as the standard model 75, the materials and tuning were based on Group A and IMSA racing specifications. 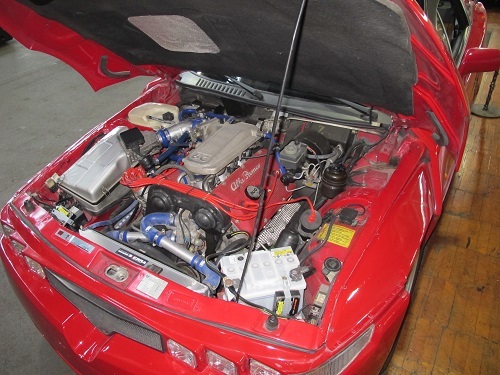 The engine received larger intake and exhaust manifolds, valves, camshaft profiles were changed, and cooling for the engine and transaxle were improved, with the result being 210bhp, up from 170. Every car, save one, was the same color scheme – red thermoplastic panels bonded to a steel shell, with a gray roof and tan leather interior. The outlier, a black-on-black car, was presented to Zagato’s chief, Andrea Zagato. 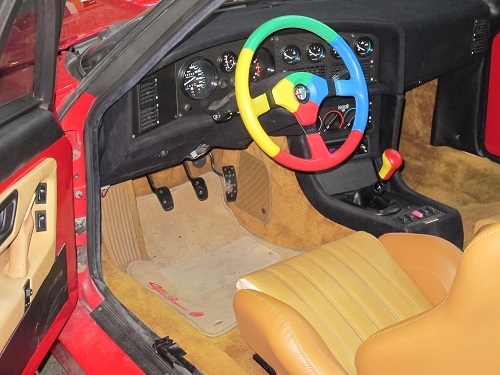 The lone high-tech aspect of the car was a button on the console; pressing it raised the car 50mm (about 2”), allowing passage over road irregularities. It had no ABS, no electronic traction or stability controls. “Il Mostro” or The Monster as it was dubbed by the press, was a traditional sports car pushed to the limits of conventional engineering. Straight line performance was very strong – 0-60 in 7 seconds – but its real prowess was handling. It was capable of 1.1G in cornering power. Combined with the remarkable low aerodynamic drag figure of 0.30Cd, the SZ could exceed 150mph and was very nearly a competition car. It was succeeded by a new GTV and Spider, ironically designed by Zagato rival Pininfarina. Production ended at 1036 examples.